You are here: Home › Where to Eat in Houston › Savor Big Flavors at the 2015 Haute Wheel Festival! 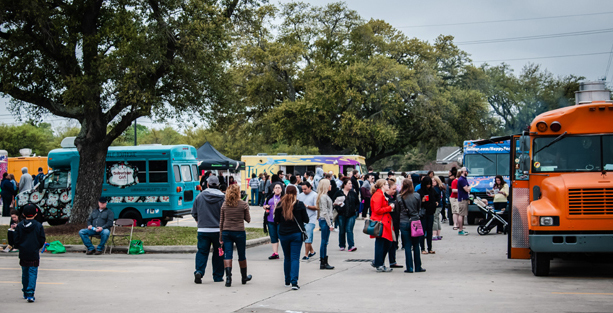 It’s that wonderfully delicious time of year again as the 2015 Haute Wheels Houston Food Truck Festival is only days away! Since its start back in 2011, Haute Wheels Houston has gained a reputation for providing a convenient place for plenty of tasty food trucks from talented chefs to gather as foodies like myself, walk from food truck to food truck hoping to have room to savor the next. This year promises to be even bigger with more than 34 food trucks ready to feed the crowd, including popular favorites such Coreanos, The Waffle Bus, Happy Endings, Good Dog Hot Dogs, The Golden Grill and St. John’s Fire. There will also be some cool newcomers on the block, such as The Pickled Pig, Happy Hour and Buttz. Whether you are in the mood for Mexican, Thai, BBQ, American, or need to satisfy your sweet tooth, there is nothing you won’t be able to find. Along with cutting edge food, Haute Wheels Houston will also feature live music, various artisan vendors, fine wines and a selection of ice cold beers. However, be rest assured that this is a family event with neat activities and prizes to provide entertainment for people of all ages. Last year, I was pleasantly surprised to see kids lined up for balloon animals and taking part in games, along with enjoy gourmet foods and desserts. Haute Wheels Houston is rolling into our city at the Houston Community College Southwest Loop Campus on March 21-22, 2015 from 12pm to 5pm. The two day festival is first come, first serve for parking, but you can get your hands on limited tickets today! Check out the Haute Wheels Houston website and save your spot for delicious fun with your family and friends!